The Samsung Galaxy Note5 has been making the headlines of late, garnering high acclaim from critics and consumers as being the phablet to beat. While the Note5 continues to relish on its success, the Xiaomi Mi Note Pro has been a _phone_ on the outside looking in with such a glare over the Note5’s popularity here in the US. Interestingly, this beastly spec’d phablet has been available overseas for some time, beating the Note5 to the punch in many markets. We’ve been using it for the last couple of weeks, so we’re eager to tell you if it’s a phablet that you should take into consideration as well. Glass meets metal, it turns out pretty well. All things considered, the glass body and gold accented metal trim bezel go nicely hand-in-hand to give it an identity of its own – one that’s impressively designed factoring its relatively low cost. The subtle curves around the back of the _phone_ also help to comfortably allow us to wrap our hand over the phone with ease. Everything about its design does nicely to compete against the Note5, and it’s nice to know that it’s lighter than its rival. Seeing that its pricing is constrained to meet such a low cost, the Xiaomi Mi Note Pro’s is lucky enough to be accompanied with such a refreshing design. The low cost isn’t evident here at all, so we have to give Xiaomi credit for being able to craft such a graceful phone that doesn’t show any hint of compromise. Its power button and volume controls are placed along the right edge of the phone, which is an ideal spot for them because they’re readily accessible. What’s a little different, though, is how they’ve placed the microUSB port on the bottom left corner of the phone, near the grill covering its microphone and internal speaker. Beyond that, it has the typical characteristics of an Android phone – like having a trio of capacitive buttons, noise-cancelling mic, and a pulsating notification light near its earpiece. It’s a relevant player with Quad-HD resolution and has some pleasant qualities. It’s a solid effort, but not as impressive as Samsung’s Super AMOLED screens. The Mi Note Pro doesn't seem to be messing around when it comes to its screen. 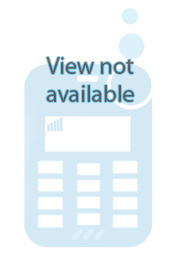 This is evident by just looking at the specs of the display they’ve come up with. Keeping itself in good company, it’s sweet to find that the Note Pro is sporting a 5.7-inch 1440 x 2560 (Quad-HD) LCD display, which delivers superb details with its 515 ppi pixel density. Indeed, it’s making itself a relevant player in the space by offering Quad-HD resolution, and it also has some other favorable aspects, as well as some areas that can be improved. Those areas of opportunity include its ~7600k color temperature (in standard color mode) and maximum luminance of 424 nits. Starting with the former, the screen exudes a slightly colder tone than natural. And with the latter, it’s decent enough to view in most conditions, but when the sun is around, it can be quite a challenge. Nevertheless, it does decently in color reproduction, which is evident in how it reaches many of the target values in the sRGB spectrum. It’s not as accurate as the Note5’s display, but it’s still within reasonable liking. Admittedly, all of these figures can change because we can change some of the display’s parameters in the settings menu. In our testing, we set its colors to the ‘standard mode’ for a more accurate reproduction. There’s also an option to choose what color tone the display favors, which includes warm, standard, and cool. The Samsung Galaxy Note5 has been making the headlines of late, garnering high acclaim from critics and consumers as being the phablet to beat. While the Note5 continues to relish on its success, the Xiaomi Mi Note Pro has been a phone on the outside looking in with such a glare over the Note5’s popularity here in the US. Interestingly, this beastly spec’d phablet has been available overseas for some time, beating the Note5 to the punch in many markets. We’ve been using it for the last couple of weeks, so we’re eager to tell you if it’s a phablet that you should take into consideration as well. All things considered, the glass body and gold accented metal trim bezel go nicely hand-in-hand to give it an identity of its own – one that’s impressively designed factoring its relatively low cost. The subtle curves around the back of the phone also help to comfortably allow us to wrap our hand over the phone with ease. Everything about its design does nicely to compete against the Note5, and it’s nice to know that it’s lighter than its rival. 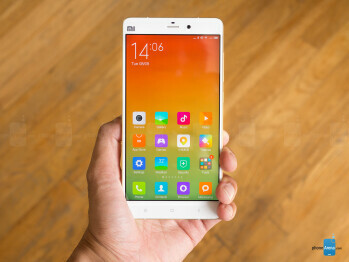 The simple and elegant layout is something to like about MIUI 6.0, but it lacks the diversity that power users crave. 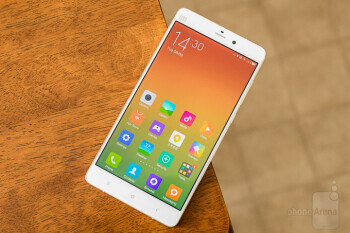 Since the last time we’ve encountered a Xiaomi smartphone, there hasn’t been any notable changes with the experience – albeit, the Mi Note Pro is lucky enough to be in Lollipop territory now. At the core of it all, we’re still exposed to the MIUI 6.0 skin, which is undoubtedly an experience that few folks in the US are accustomed to using. MIUI is one of the most profound and deep attempts at customizing the stock Android interface to the point where it’s hard to recognize you have Android running on the phone. Honestly, though, our first impression tells us that it tries to emulate iOS with its icon-filled homescreen. Some of the signature features include the fact that it is well optimized to run, with smooth, good-looking animations, extensive customization options, and support for themes. 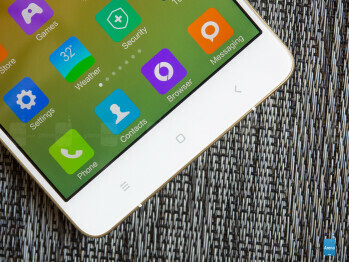 With Xiaomi’s clear focus on the Chinese market, though, the nagging question about the MIUI skin is whether it’s well-adapted for use to those outside of China. The answer is ‘not really’. That’s because the experience is riddled with some bloatware tailored for the Chinese market. Yes, the simple and elegant design language of the experience is favorable on so many levels, but it doesn’t have a deeper roster of features to sell it to power users. 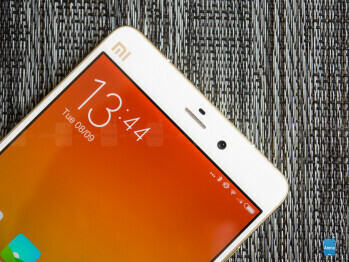 Qualcomm’s Snapdragon 810 chip shines brightly with the Xiaomi Mi Note Pro. 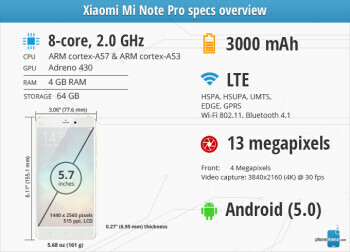 Just like its decision to go with Quad-HD resolution with its screen, in order to remain relevant, the Xiaomi Mi Note Pro makes for a good argument with its 64-bit based octa-core Qualcomm Snapdragon 810 MSM8994 SoC accompanied with a generous 4GB of RAM and the Adreno 430 GPU. It’s almost insane at how smoothly it performs when navigating around the platform, which is a testament to the optimizations done to the software. Over on the gaming side, it’s a champ at graphics processing, where it accrues slightly more frames than the Note5 in the GFXBench tests. It just means that this thing will handle even today’s most demanding titles out there. The lack of a microSD card isn’t anything new nowadays, but it’s comforting to know that Xiaomi is generous enough to provide an ample 64GB of internal storage with the Mi Note Pro. You can choose to go with Xiaomi’s stock web browser, but you’re better off just downloading Chrome for that richer experience. As with most high-end phones, the Mi Note Pro is a champ when it comes to surfing the web with its buttery smooth navigation, tight page rendering, and lickety-split page loads. Add to that, the ample amount of real estate and detail dished up by its Quad-HD display ensures it delivers the goods with the experience. A global traveler it is, thanks in part to its GSM radios and support for LTE-A Cat 9, the only limitation here is the lack of CDMA support, which means that you’ll be out of luck trying to get it to work with Verizon or Sprint here in the US. Connectivity-wise, it’s packed with all the essentials, such as aGPS with Glonass, Bluetooth 4.1, and dual-band 802.11 a/b/g/n Wi-Fi, but it’s rather disappointing that NFC isn’t part of its arsenal. Still shots are OK, but don’t have high expectations with the video recording quality. 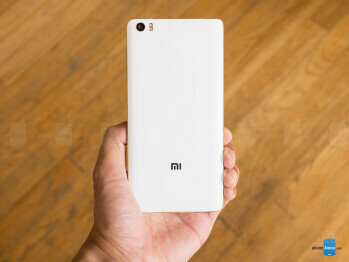 The Xiaomi Mi Note Pro ships with a 13-megapixel main camera using Sony’s IMX214 CMOS sensor, which is also accompanied with a 6-element f/2.0 aperture lens, Philips 2-tone flash, and OIS. 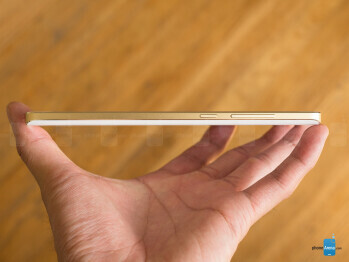 The front camera, too, is especially inviting with its 4-megapixel size with large 2-micron pixels. All of its gear sounds mighty delicious! At first sight, the camera app is very reminiscent to the one we’ve seen on iOS, with a very similar interface, and even the option to control the exposure in a manner similar to that on iOS. And while it copies its design approach and simplicity, it does have quite a few settings that you can manually tweak, including a manual shooting mode. Speaking of different modes, you can swipe left or right inside the app to bring up various filters, as well as access different modes like HDR and Panorama. The Mi Note Pro is quite a capable phone for most shooting situations. Detail levels are decent, and the white balance is mostly fine, though at times it does get colder than needed. Exposure could also be a bit better, as certain images tend to come out a bit darker than they should. We’re pleased by its HDR mode as well, blending enough color saturation and exposure adjustment to the mix without being too artificial. Under low light, noise is kept in check, but the compromise is made in its softer details. Oddly, though, the 2-toned flash loses its effectiveness at around 7 feet – where it tends to wash out images. Having 4K video recording adds some versatility to its arsenal, but the results from it are rather underwhelming. Normally, there’s a substantial amount of detail superiority that accompanies 4K capture, but there’s just this softness with its quality that prevents it from really standing out. The softness is something that manifests and becomes more problematic when switching to its 1080p recording. We’re also not fans of its scratchy audio recording, which is something that’s extremely distracting when you try and play back something you just captured. The media experience on the Mi Note Pro is tailor-made for the Chinese market, starting from the gallery app, and going to the music and video players. The gallery, for instance, is a fairly straightforward affair, and it offers you the nice option to back up your images in the Xiaomi cloud. This is a nice option (we did notice some Chinese characters when registering and setting up the account, but nothing that would make registering impossible for those who don't speak Chinese), and the phone backs up your images effortlessly, but we did notice that trying to retrieve or just browse through those images was a bit slow. As for the video watching experience, it has no issues playing various formats and codecs of videos. It is also tightly integrated with an online streaming function that allows you to watch the latest Chinese soap operas and even full-on movies without paying a dime. The only thing missing here to solidify its package is just a handy multi-tasking element of some kind. The music player is a very straightforward affair with no fancy options: it shows you all your music arranged in alphabetical order, and you can also conveniently view songs by files and folders. The speaker positioned on the phone’s bottom edge cranks out 75.6 dB of audio power, and while it seems good on paper, its quality in reality lacks depth – making it sound subdued. Strong fidelity and clear voices through the earpiece makes it inviting to use for phone calls. Taking on a phone call is rather inviting with the Mi Note Pro, seeing that there’s a decent amount of fidelity accompanying voices through the earpiece. Background noise is generally kept at bay, allowing us to focus our attention on the direct voices of our callers. However, the speakerphone leaves much to be desired due to its subdued quality. On the other end, callers are treated to deep and audible tones that reduces the need for having to ask us to repeat ourselves. 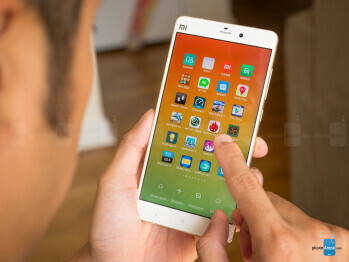 Disappointing for a phone with a 3000 mAh battery, the Xiaomi Mi Note Pro's battery life is unsatisfying. The Note5 set the bar high for phones packed with a 3000 mAh battery, so how does the Xiaomi Mi Note Pro’s same capacity perform? Unsatisfying, that’s just the downright truth. In our day-to-day usage, its 3000 mAh battery generates an effective amount of juice to get us through a solid 8 hour work day, but it’s generally in the red way before we’re even close to getting into bed. Under our battery benchmark test, it sputters out a mere 5 hours and 22 minutes, which is a far cry from the 9+ hours we get from the Galaxy Note5. One bright spot in all of this, however, is found in how the Xiaomi Mi Note takes 93 minutes to get its battery cell back to 100%. That’s pretty fast, despite it being technically longer than the Note5, but we still enjoy its quick charging time. Xiaomi Mi Note Pro review unit provided by ShopJoy.com.au.